Who are the best fantasy football plays for building an optimal DFS lineup in Week 12 of the 2018 NFL season? As we do every Saturday, this piece brings you the DFS locks of the week. The Colts are 8-point home favorites against a Dolphins defense that has been ripped by good quarterbacks this year, including Tom Brady (274-3), Mitchell Trubisky (316-3), and Deshaun Watson (239-5). Luck has three (or more) scores in seven straight. Winston is cheap, and his Bucs are 3-point home favorites in a game with the highest over/under of the slate (54). His opponent, the 49ers, have given up the ninth-most points to the position. In his two full games, Winston averaged 380 passing yards and 2.5 total touchdowns per game. Jackson was the centerpiece of a run-heavy Ravens attacked in Week 11, and that will likely be the case again in Week 12 against the Raiders. Jackson is a threat for 100-plus rushing yards again, and his passing numbers will be better this week against the Raiders, who have given up at least two passing touchdowns in all but one game this year. Gordon and the Chargers are massive 12.5-point home favorites against the Cardinals, who have given up the fifth-most fantasy to running backs this year. Arizona has given up the second-most rushing yards (1,286) and third-most rushing touchdowns (11) to running backs. 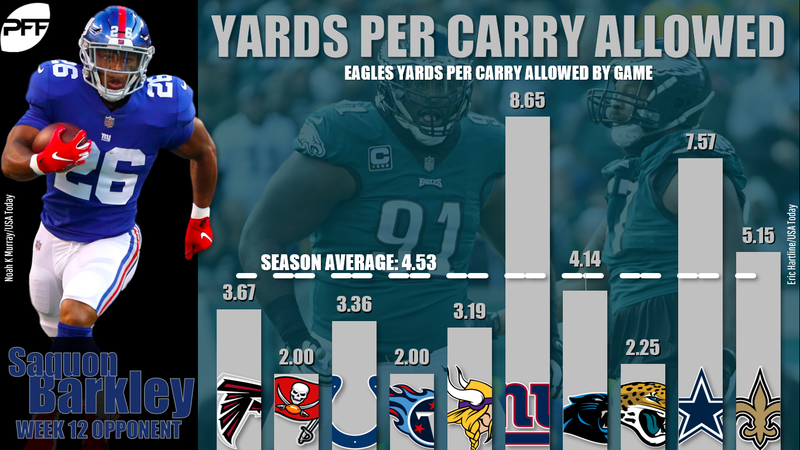 Philly’s usually-strong rushing attack has been reeling in recent weeks, having given up 159 yards and 1 touchdown (7.6 YPC) to Dallas and 170 yards and 2 touchdowns (5.2 YPC) to the Saints. And that’s after Barkley torched the Eagles for 147 yards and 1 touchdown (8.6 YPC) — plus another 99 receiving yards — back in Week 6. Since returning from injury, Fournette has been a total workhorse by averaging nearly 30 touches per game (!). He hasn’t been super efficient, but he has scored in each game while topping over 100 yards. The high volume will continue, but the efficiency should increase in Week 12 against the Bills, who have given up the sixth-most fantasy points per touch to running backs. Mack, playing at home on the fast track, will face a Dolphins defense that has given up 173 total yards and 1.2 touchdowns per game to opposing backfields. The Colts/Dolphins game has the second-highest over/under on the main slate (51), with the Colts serving as 8-point favorites. Mack should push for 20 touches. Chubb, who has averaged 21 touches per game over the last month — including 23 per game over his last two — has a plus draw against a Bengals defense that has been tagged for over 120 rushing yards and 1 rushing touchdown per game by running backs. Beckham is averaging 6.9 receptions, 93 yards, and 0.5 touchdowns per game this season, and I’d consider that his floor in Week 12 against the Eagles, who have ceded the second-most fantasy points to wideouts on the year. Brown has a touchdown in all but one game this year — and that was way back in Week 2. Brown squares off against a Broncos defense that ranks in the bottom-half of the league in terms of fantasy points per target surrendered to wideouts. He remains one of the safest bets in DFS. Evans projects as our highest-owned wideout on both DraftKings and FanDuel — and for good reason. As noted above, the Buccaneers are home favorites in a game with the highest over/under on the slate (54). He will only run about 50% of his routes against Richard Sherman. Edelman has one of the best individual WR/CB matchups of the week against Jets slot man Buster Skrine, who has given up 2.18 yards per route run — second-most among this week’s starting slot cornerbacks. He is PFF’s fifth-lowest-graded starting slot corner (grade of 47) of the weekend. The Giants have been exposed by tight ends for most of the season, having given up over 50 yards to the position in seven of their last eight games. They have only given up one touchdown to the position on the year — but it was to Ertz back in Week 6. The Giants have also given up at least seven receptions to the position in four of their last five games. 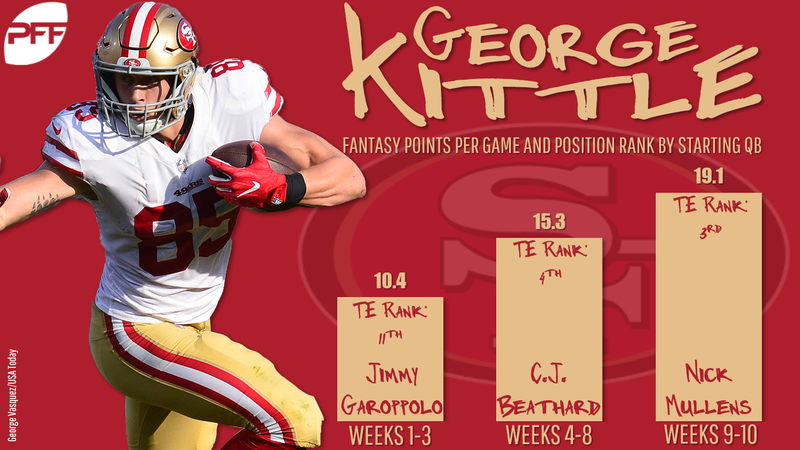 Kittle has the second-best individual TE matchup of the main slate against the Buccaneers, who have given up the third-most fantasy points to tight ends this year. The Bucs have also given up the third-most receiving yards to tight ends this year. For his part, Kittle hasn’t missed a beat with Nick Mullens under center; Kittle has dropped 4-108-1 and 9-83-0 over the last two games. The super-cheap Brate will garner a lot of attention in DFS this week. The matchup against the 49ers is interesting, as San Francisco gave up a touchdown to tight ends in four straight games to start the year but haven’t given a TD to the position since then. At this price point, and with no competition at the tight end position with O.J. Howard on injured reserve, Brate has good odds to return value.